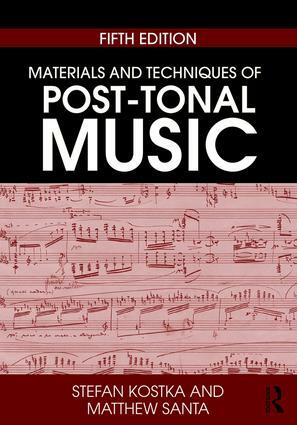 Materials and Techniques of Post-Tonal Music, Fifth Edition provides the most comprehensive introduction to post-tonal music and its analysis available. Covering music from the end of the nineteenth century through the beginning of the twenty-first, it offers students a clear guide to understanding the diverse and innovative compositional strategies that emerged in the post-tonal era, from Impressionism to computer music. a companion website that provides students with links to recordings of musical examples discussed in the text and provides instructors with an instructor’s manual that covers all of the exercises in each chapter. Offering accessible explanations of complex concepts, Materials and Techniques of Post-Tonal Music, Fifth Edition is an essential text for all students of post-tonal music theory.